Come alive in the colour and joy of turquoise with us! This array of the finest turquoise pendants will win all the hearts and fancy of the admirers who look your way. With a virtually never-ending selection, we have put our best efforts and resources to bring you the idyllic designs that suit your individual style the best. So, scroll and seek the best pendant choice! Solitaire pendants have a rich and magical show of a single stone delight. Studded with a large and exquisite stone at the centre, the solitaire pendants in our array come with either minimal prong-setting for design or some elaborate and finely detailed designer work accompanying the might of the stone. On the other end of the spectrum is our presentation of cluster pendants. With more stones, our designs promise more joy. The vivacious colour of the stone multiplies in the close setting and looks fantastic at the base of your neck. The said pendants in this category offer you luxurious designs with creative detailing. Our most-loved and popular turquoise pendants come under this selection. It is here where you will be privy to the exotic and enticing designs that you just cannot deny! TJC celebrates jewellery in the best and the most unique way, and if that isn’t a good enough reason to choose us, then we don’t know what is. 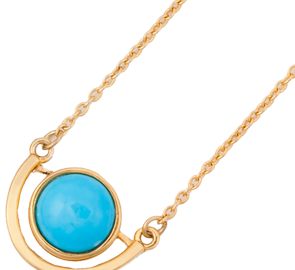 Here, you’ll find transformational turquoise pendants that suit all your requirements. We have pendant that have only the embellishment of turquoise, and we also have some features with multiple gemstones. From the simple designs to grandeur in designs, we have covered everything imaginable. And that is the biggest and best reason for you to come shop with us. Other than that, we are known for resourcing our gems straight from their mines. By doing this, we not only ensure of the genuine and authentic quality of your gemstones, but we also eliminate the need of middlemen, which brings down the prices. It allows us to offer you affordable turquoise pendants.